The Bonner Program is a four-year, service-based college scholarship program that affords students an "access to education and opportunity to serve." The program recruits and supports a diverse pool of low-income, first generation students who are committed to changing the world through service. The program model is cohort-based (5-40 students in each class), intensive (280+ hours per school year and, for most Bonners, full-time summer service internships), and developmental (integrating experiential, curricular, and co-curricular service and learning leading to a capstone community-engagement project and a culminating reflection presentation). Below we describe the four-year developmental model, the six Common Commitments upon which the program operates, and the kinds of service leadership roles Bonners in the program. The Bonner Leader Program leverages the community-service work-study funding to enable students to participate in the four-year developmental model for community engagement. The “access to education” portion of the Bonner Program’s motto references the Bonner Foundation’s requirement that schools with Bonner Leaders have at least 75% of the participating students qualify for Federal Work-Study, though most have closer to 100% qualify. Schools have the option to award students with “College Work-Study” or some other private source for the stipends. Each year schools recruit and select as few as five and as many as 40 incoming first year student into their Bonner Program, with a typical size of 15 Bonners per class. We encourage schools to maintain a gender balance of no more than a 60%/40%, while also recruiting a diverse of student by race, ethnicity, and first generation status. The “opportunity to serve” portion of the Bonner Program motto references the Bonner Program’s model for leveraging the work component of a student’s financial aid package to enable them to earn money for college through community work. Participating schools commit to awarding Bonners a four-year stipend from (or equivalent to) Community Service Federal Work-Study for 10 hours per week. Schools generally meet this expectation through their Federal Work-Study Program (FWS) which requires schools to award a minimum of 7% of their annual FWS grant for positions where they serve in the local community with non-profit or government agencies. Many schools also provide additional financial aid scholarships to students in their Bonner Program. Some of these are designated service-based scholarships while others are institutional funds or discounts awarded to students because they are enrolled in the Bonner Program. The Bonner Program is built along a four-year developmental model for students. This model translates into a scaffolded set of expectations and experiences, both in the context of community service and engagement and within students' academic and co-curricular learning. 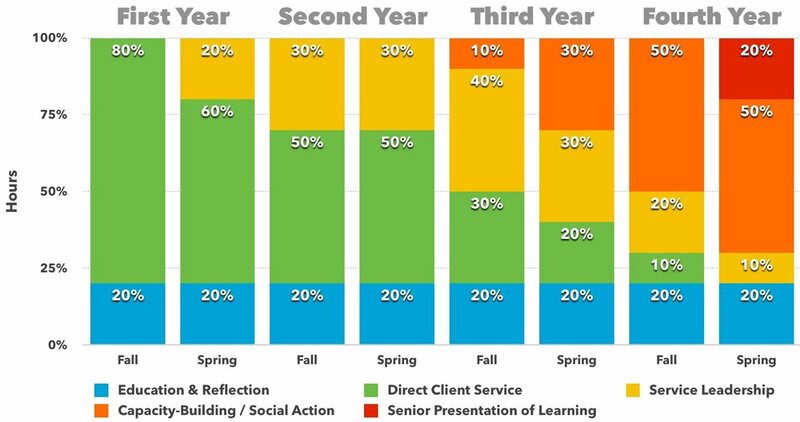 Bonners community engagement focus and roles evolve over their four years in the program, as shown by this sample progression showing how the 140 hours per semester change from the first year to last. Click to enlarge image. At the core of this model is the opportunity for students to work part-time over each semester in the academic year, and often supplemented by full-time summer internships as well. A student can even stay with the same partner – typically a school, nonprofit organization, or government agency– over multiple years, taking on increased leadership, program, and management roles. Even when a student moves to different sites, s/he is expected to grow. Through intensive training, reflection, and advising, students develop and refine their "Community Learning Agreements" and positions each year. The Bonner Program supports students through all four years of their time at Brown with combining community engagement and academic scholarship. In this video, several participants talk about their experience in the program. Bonner Scholars and Leaders engage intensively in service as well as training, education, and reflection (8-10 hours each week) during all four years of college. They serve in schools, nonprofit organizations, and governmental agencies to address community identified needs and to tackle issues like education, safe and affordable housing, food insecurity, college access and youth development, environmental sustainability, and so on. Bonner Scholars (and many Bonner Leaders) also engage in at least two full-time summer internships. Effectively, students experiences correspond with those of high-impact educational practices. Through students’ sustained involvement over multiple semesters and years, and supported through intentional education and reflection, students develop a range of skills, knowledge areas, and post-graduate outcomes. The student developmental model also provides structural supports for students to grow as community leaders and civic minded professional on and off campus. Students identify, develop, and integrate service and civic engagement passions, academic studies, and career interests. Students are challenged and supported to grow as leaders as well as demonstrate active citizenship. At service sites, in courses, in Bonner meetings, and in special roles (like Bonner Congress), students take on challenging responsibilities as they advance. Overview presentation on the Bonner Program. The four-year student development model has five stages we refer to as the “5 E’s.” These are implemented in co-curricular, curricular, and integrated ways. In service positions with schools, governmental agencies, and non-profit organizations, students learn and apply a variety of skills and knowledge areas. Their work builds the capacity of programs, organizations, and communities. Expectation — Bonner Programs intentionally recruit and accept students who show an interest in and commitment to community service and engagement. Explore — New Bonners are intentionally involved in a variety of service sites and activities, which helps them to then identity their passions and make a long-term commitment to a particular place (community), site, and issue areas. Experience — Students then focus on developing more skill and knowledge within their given place (community), site, and issue areas. They begin to understand more deeply the mission, operations, and programs of a particular agency and to develop greater understanding of community issues. The 5 E's summarize the four-year Bonner developmental model. Click to enlarge image. Example — As students progress they take on expanded service leadership roles and responsibilities on campus and in communities (often local, national and global). They many lead and mobilize students at their site and engage in complex projects like related undergraduate research. Expertise — Finally, students work on community-engaged capstone projects, often in the site or issue in which they have engaged multiple years. They even initiate program development or assume management. Students often integrate academic studies, through capstones, and career interests. Students create a culminating public Senior Presentation of Learning, an opportunity to reflect on and share their entire developmental journey, learning, and accomplishments with peers, faculty, partners, and family.